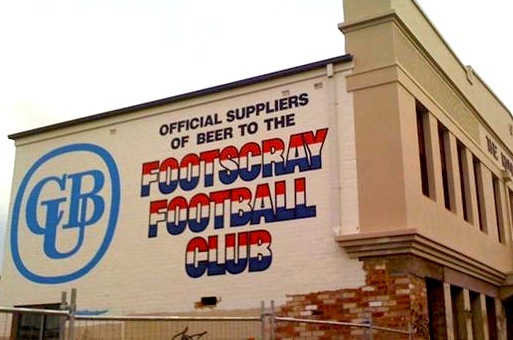 Living in Footscray, it’s hard to ignore the fact that as a Richmond supporter, I am in ‘enemy territory.’ (I’m actually quite partial to Footscray!) 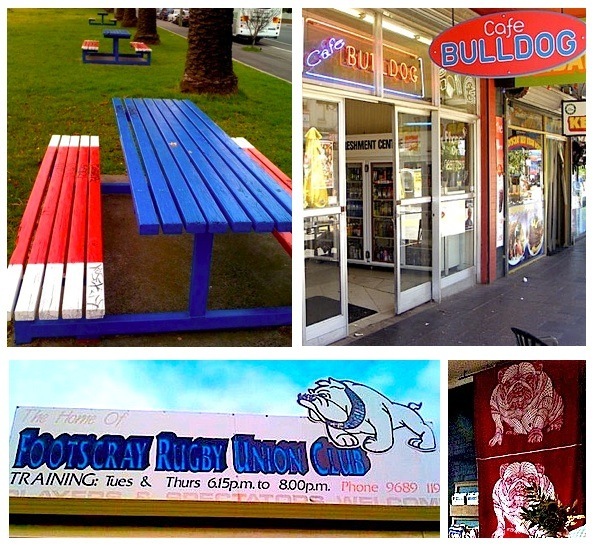 Unlike a lot of clubs, there is still a strong link between the suburb and the footy club. 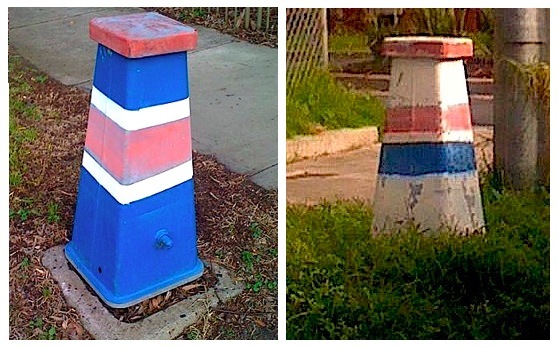 When I came across the below fire hydrants, I decided to do a little tour of the village in search of red, white and blue. 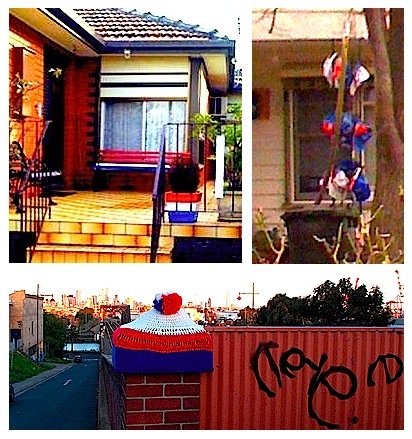 What impresses me is that the fire hydrants of Footscray encompass both home and clash strips! This is Doug Hawkins first of two appearances in this post, fitting given the connection he appeared to share with fans. He was one of them in a way. This is one small part on a wall outside Footscray City College, a large mosaic depiction of Footscray. Above Doug is some fantastic old advertising on the Rising Sun Hotel (now apartments…nearly), over the road from the Western Oval, while other street art around Footscray shows a great love for the dog. There’s even a Dancing Dog cafe! We’ll skip momentarily out of Footscray, yet stay firmly in the west. 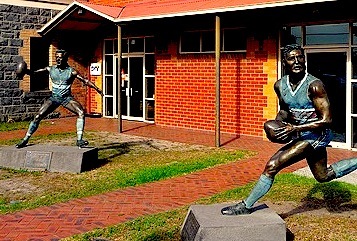 The Braybrook Hotel proudly houses these fantastic statues of two Braybrook boys in EJ Whitten and Hawkins, arguably Footscray Football Clubs biggest personalities and two of the very best. Surely there’s no need for security with these two out the front night after night? Below is another wall mural, this one running along the Barkley Street side of St.Monica’s Primary School. 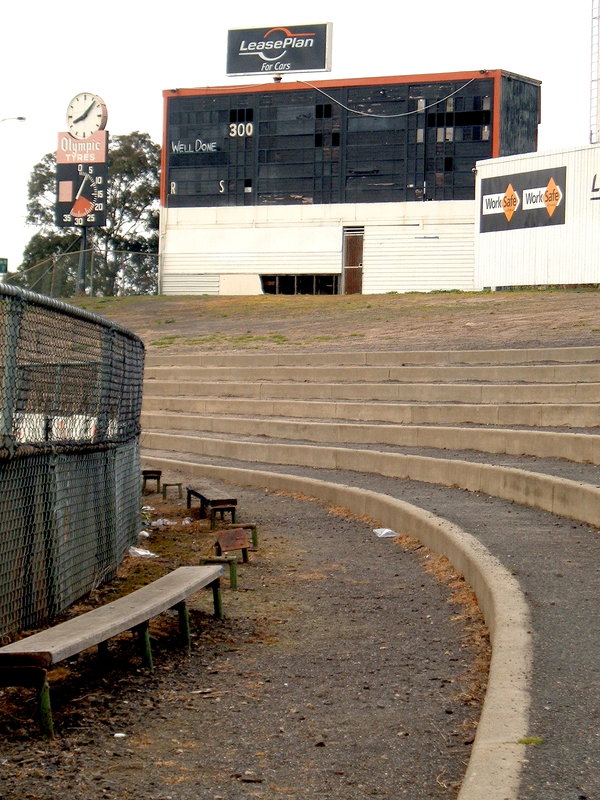 The scoreboard reads Footscray 18.24.132 to Collingwood 11.10.76. If only that were the case more often than not! 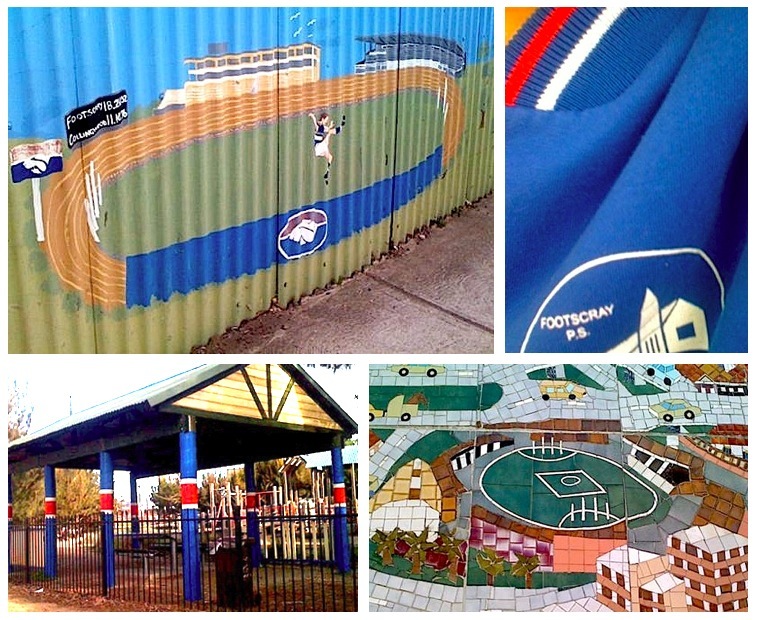 We also see that Footscray Primary’s uniform is red, white and blue, and back to the mosaic wall for another take on the Western Oval, along with a Bulldogs inspired playground. 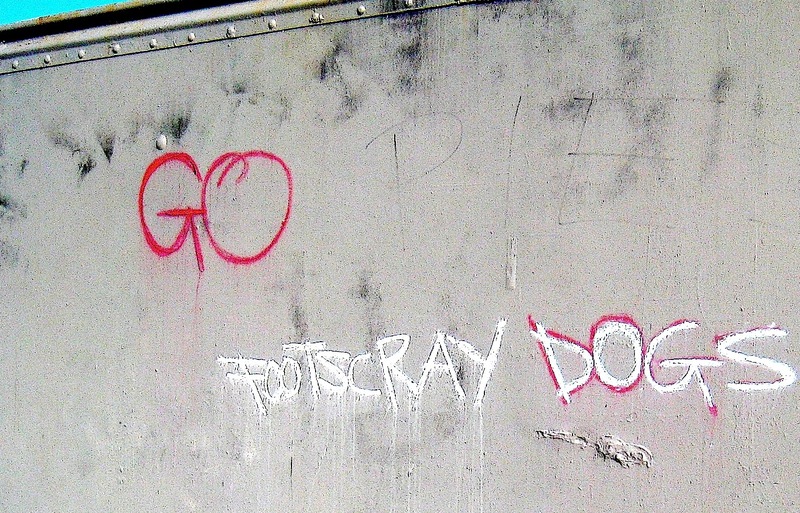 And lastly this bit of graffiti, pointed out to me by Vin Maskell of the fantastic scoreboard pressure blog, sums it all up for me. For no matter where you are, there’ll always be a Collingwood supporter showing a bit of cheek. 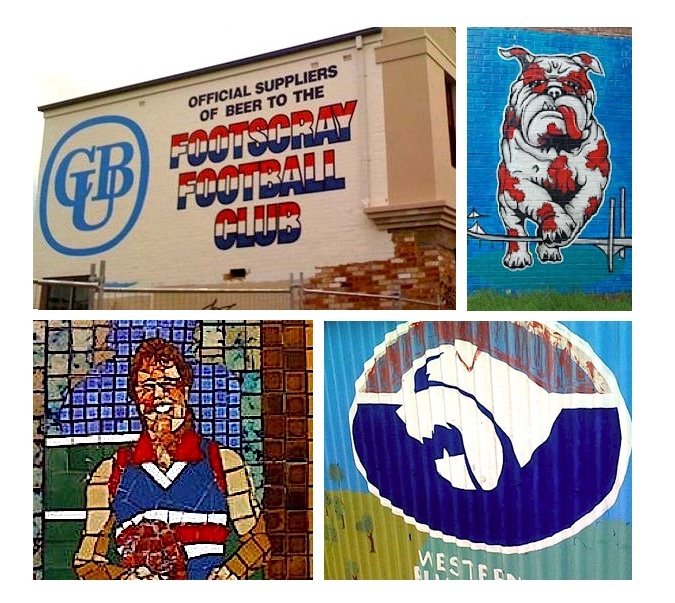 Be sure to check out Vin Maskell’s piece on the Western/Whitten Oval for his sight Scoreboard Pressure, an in depth look at scoreboards from a scoreboard enthusiast! A big thanks to Vin for using some of my photos, much appreciated and glad they could be of use!